Parking in Rimini is very awkward, especially during summer time. Most people arrive in town with their own car. Parking lots along the seafront are few and expensive. From April 25th to September 30th rate is 1,80 euro per hour, day and night too. Moreover, once you found your lot, you have to go to the parking meter every day. Most of hotels in Rimini can’t really solve the inconvenience. They have few and tight parking lots, so if you ever find one available, you need to give the key of your car to valets. That’s because they will need to squeeze vehicles tight together. This means they will move other cars any time you need to use yours. Always hoping nobody forgot to give his keys to the valet. My suggestion: always verify parking service before you book an hotel in Rimini. At Savoia Hotel Parking service is a very strong point. We have a huge garage with 90 parking lots at our -3 floor. You do not give your keys to anybody. You arrive, park your car and reach your room by elevator. This is a significant privilege as it allows you to enjoy your stay without worries about your car. Parking lot rate is € 16 per day. It is not possible to park cars in LPG or CNG in our garage. The service is subject to a fee and is reserved on booking. 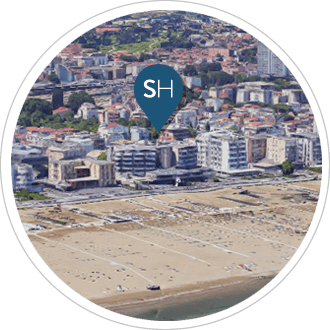 Excellent hotel with rooms with view on the beautiful beach of Rimini, convenient underground garage, located in the central area of the promenade.